Nothing beats a nice refreshing shower after a long day or a strenuous workout. You may not realize it but your relaxing shower could lead to costly and expensive repairs down the road. Whether it’s that gorgeous shower caddy overloaded with luscious-smelling body washes, rich conditioners and soaps hanging off your showerhead, or the hair you don’t realize is headed down the drain, you could be causing damage to your plumbing. Some of these bad shower habits are easily remedied. Take a quick minute and be sure you are not hanging anything too heavy from your shower fixtures. Most are not designed to bear the weight of heavy shampoo bottles, caddies and all the other creature comforts we love to fill our bathrooms with. Too much weight can strain joints and pipes. Be sure to always check your bathroom fixtures to ensure they are working properly. If some part of your shower leaks or is not working correctly it may cause problems with the plumbing that you cannot see. Mineral build-up can result in corrosion in fixtures and pipes. If you have hard water and plan to remain in your home long-term, it may be worthwhile to consider a water conditioner. Also consider what goes down the drain when you shower. It’s often assumed that only toilets and sinks clog, because all we’re sending down the shower drain is hot soapy water, right? We’ve all seen the nightmarish photos of “fatbergs” in the sewers of major metro areas and assume that as long as we’re not sending wipes and cooking oil down our drains we’re safe. And while you may not be unintentionally building a “fatberg” the size of a London double-decker bus in your home’s plumbing system, your shower habits could creating a miniature version of these nightmarish clogs. A shower or tub drain has a “trap” designed to always have liquid in it to stop bad odors from coming into your home through the drains. Unfortunately this also makes it susceptible to clogs and build-up. It might seem like a stretch but even clean and well-groomed individuals with short hair may still send a fair amount of waste down the drain from a shower. A few hairs (long or short) here and there can eventually build up and if not removed properly can result in damage to the plumbing, especially when combined with large amounts of conditioner, soaps, bath bombs, and body washes that are rich in emollients and moisturizing ingredients. Some of these are as oily as cooking waste and when caught in hair and other drain-clogging matter can form a pretty impressive blockage. It’s a good idea to ensure you have a drain protector in your shower to catch hair and debris. There are many good ones on the market that are inexpensive but highly effective. Maybe one day a drain protector might rescue a dropped piece of jewelry as well as prevent clogs, but in the meantime it’s going to keep the bulk of hair from heading down the pipes. Be sure to clean these out regularly or they won’t work as effectively. If you like to use rich moisturizing shower and hair products be sure to rinse thoroughly and run extra hot water down the drain after use. 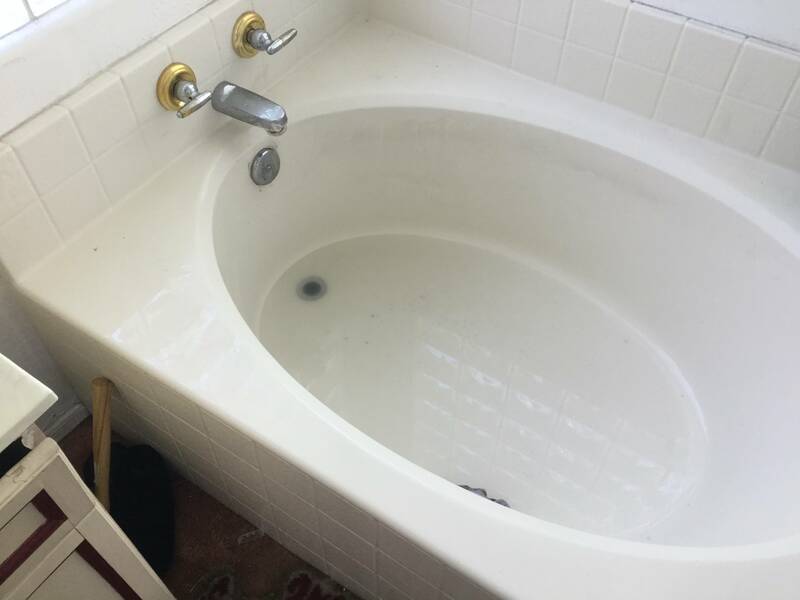 Clean your tub or shower enclosure regularly to prevent build-up- which can be even worse if it heads down the drain. If you do discover you have a clog in your shower or tub, be sure to clean it out properly. Many homeowners may make the mistake of dumping large quantities of chemical drain “opening” substances down the drain rather than physically removing the clog. It’s a far better idea to use the standard and inexpensive hair clog strip “Zip It” style removers, which are a flexible strip of plastic with a handle on one end and sharp barbs. These are very effective at quickly pulling out clumps of hair and detritus from a drain provided it is within reach of the tool. 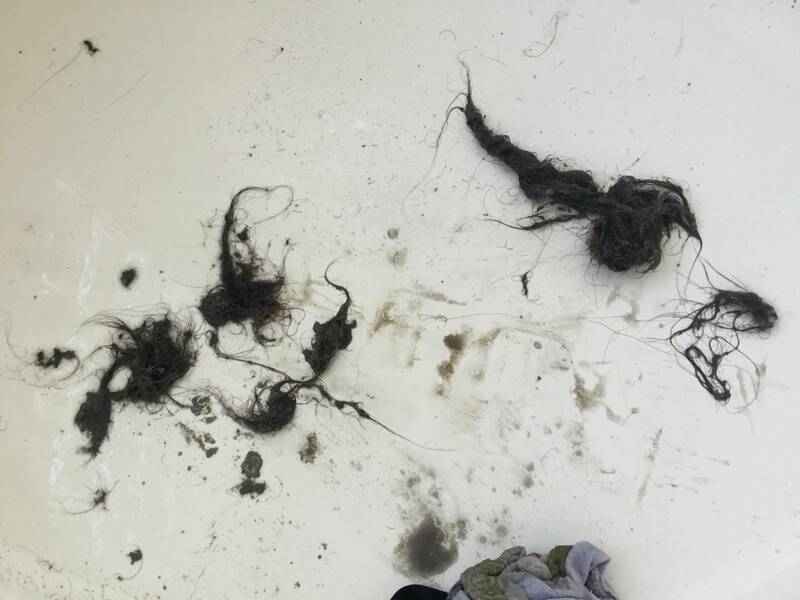 Most hair build-ups in a shower can be removed with these tools so it’s a good idea to regularly check for build-up before the water starts to back up and utilize enzymatic cleaners to maintain your drains and pipes. Plungers and small drain-snakes may do the trick, but in the event you are not successful, you will need to call in a professional. Chemical lye-based “drain openers” may be effective for some minor clogs but repeated or improper use can damage plumbing and pipes. They are bad for the environment and potentially dangerous to use. Leaving these chemicals in contact with your longer than recommended or using too much could result in softening of the pipes or damage to the bonded glue on pipe joints, resulting in even bigger problems. PVC and ABS pipes are not rated for the high temperatures that could result from improper use of these chemical cleaners. 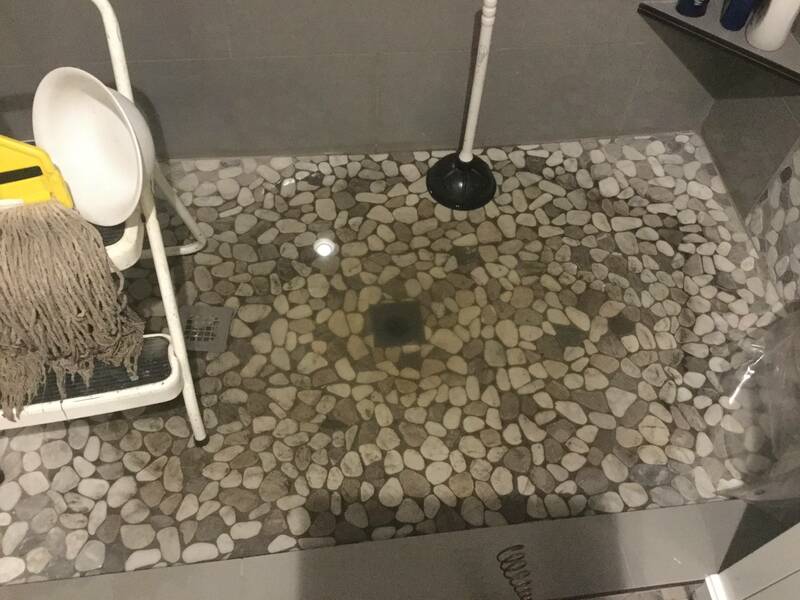 Shower pipes and drains are often in floors and behind tile walls, and if one of these is damaged by a chemical product the problem could be very expensive to repair. And if the chemical drain opener was not effective, what’s left in your clog and plumbing can be dangerous in the event you do try to use a plunger or snake where any spattering may occur. The chemicals in these can cause serious harm and injury to you if they come in contact with skin or face. Therefore, it’s better to try and remove the clog with a plunger, zip tool or snake first because once the chemicals go into the plumbing you have no way of knowing where they are and if you need to call a professional plumber you may be putting them in harm’s way as well. Good shower habits can keep your bathroom functioning effectively for years to come. Preventative measures can protect your plumbing and help you enjoy guilt-free showers and baths. If you ever run into problems, feel free to call George Brazil Plumbing and Electrical! We service the entire valley including Phoenix, Scottsdale, Tempe, Mesa, Gilbert, Surprise, etc.